Helping others can often result in others helping us. The gift of being a giver is often that the giver becomes a receiver. Such was the case for Jean Vanier, founder of L’Arche (The Ark). Son of a Governor General of Canada, Vanier had the freedom and resources to choose whatever life he desired. His career began in the Royal Canadian Navy, followed by the pursuit and achievement of a Doctorate in Philosophy, followed by teaching at the University of Toronto. Then came a visit to a friend, a priest, who worked with people with disabilities. It was that visit that led to Jean’s undeniable request from Jesus to take a man or two to live with him … men from an institution, who suffered mental and physical handicaps. They lived, daily living, together. Jean thought that HE was doing for them, yet, the giver became the receiver. This past summer I read a book that made me … ponder my career field. I work as an Educational Assistant in a middle school. Within this field I get to work with students who have been diagnosed as having special needs (don’t we all? ), as well as those who simply struggle to learn at the typical speed or style as the majority of their peers. I also get to work closely with those who teach these students, and their parents … it’s a team mentality, with all striving for the best from each particular student. At the end of last year, a student in the high school I worked, handed me a book and said I should read it (I learned long ago, that when a child or teen says such a thing, it is imperative that I do so). As I read, “Look Me in the Eye“, by John Elder Robison, I began to ponder my training to work as an Educational Assistant. John is a successful adult, who happens to also have autism. This, then, has led me re-visit the life of Temple Gandin. Another successful adult, living with the challenges that autism can bring to an individual (and those who love them). In the past month I have been investigating these two individuals, listening to them speak, reading what they have written, on their lives, and their needs, and their strengths as well as weaknesses. I have realized that my formal education in special needs taught me little about what those with special needs know. Instead I was taught what psychologists, behavioral specialists, doctors and teachers believe they know about everything from autism to Fetal Alcohol Spectrum Disorder (FASD) to Down’s Syndrome (Trisomy 21) to Fragile X to hearing impairment and so on. If a person wanted to learn the piano would you learn more from someone who studies pianos, or one who plays them? If a person wanted to learn about cooking would they go to a food critic or a chef? If a person wanted to learn about building a house, would you learn more from a building inspector or a builder? I would say that in each of the above comparisons, one would learn the most from both professionals … just as one working with those with special needs should learn from those who study the various special needs, as well as learning from those with the special needs themselves. After all, is it they who have something to teach us. Many years ago (about twenty-one actually), I experienced one of those times where I felt confident that I was God’s hands and feet. I was very pregnant with our our eldest daughter, and working in a group home for disabled adults. There were five adults living in the home, ranging from about nineteen years of age to over fifty. One had regular visits by her grandmother … I never met family members of any of the others. Four of them had lived much of their lives in institutions, and this intimate home setting would be the closest to ‘family’ that they ever experienced. I loved my job in this house, with these people. There was the woman who loved to snuggle up beside anyone on the couch. There was the woman who loved to grab tightly to hair … I think it was her way of having control, after all we picked her clothes for her each day! There was the man who regularly stripped off his clothes … from the waist down … when guests were in the house! There was the man who loved practical jokes … like the time he reached up to pinch the bottom of the lady in a line, just as a staff member stepped in front of him, and when she turned to deal with whoever was touching her behind, it was the staff member, not the jovial client who she faced. Carmelita, the first person I met when I came to the house for my job interview. She yelled at me … loudly. I was told, after I got the job, that they used her as the first line of deciding who to hire, by watching interviewees reactions to her. Carmelita, or Carm, was a lady in her late forties, born with Down’s Syndrome (Trisomy 21). She loved gaudy jewelry, all food, and babies. When I met her she was also dealing with the effects of the later stages of Alzheimer’s Disease. She was often crying or yelling. I remember the day I said, “Carm, you look so happy today” and she shook her fist at me, while giving me the nastiest face. I also remember, like it was yesterday, the night I worked at the home, alone. All of the clients were sleeping, except for Carmelita, who was in and out of crying fits. It nearly broke my heart. Despite holding her hand, and saying soothing things, nothing seemed to allow me to penetrate the misery that she was experiencing. Finally, I started to sing (I am NOT a good singer … ask my family) Jesus Loves Me, as I sat on the side of her bed, holding her hand. But, it was in the middle of the night, and I was exhausted. As I sang, “Yes, Jesus Loves …” I yawned, mid verse. Without skipping a beat, Carm abruptly stopped crying, and sang with absolute clarity, “me” to finish the verse. Then, we sang a bit more, together. After which she fell asleep. The next day, as I was recouping the sleep I had lost that previous night, I was awakened by my hubby, who told me that Carmelita had never awakened that morning, and that she had died. To know that our shared song, of the most theologically relevant message, would be the last Earthly experience she would have, allowed me to feel that I was being the very hands and feet … and even really bad singing voice, of God. I truly do consider it a privilege to work with the students that I do. Their ‘challenges’ are the reason that I have a job. The guest post for today is an audio link to a broadcast from Focus on the Family (www.fotf.ca). The link is of Ben Glenn speaking about the challenges in his life, including ADD (Attention Deficit Disorder) and Dyslexia. It is called Living With ADD, and in his story I can see the experiences of a few students with similar challenges. I can see the rejection, I can see the confusion. Thankfully, I do believe that today school staff, psychologists, doctors and parents communicate much more clearly to students about the challenges that they have been diagnosed with. We still tell them they are special, but we tell them they are special, not because of their diagnosis, but because they have value as a person, and, as a Christian, we share that they are made in the image of Creator God. Numerous times I have offered my own perspectives on those with challenges, or special needs (Beautiful Disorder). I have also offered my perspective on the parents, and especially the moms of children with special needs (Moms That I Admire), as well as their perspectives on having a child with special needs (Things Not To Say To A Parent Of A Child With Disabilities). What I love about this audio of Ben Glenn is that it is from the perspective of a person with special needs challenges, and it is so worth hearing his voice. I have to say, I fully understand the feeling of speechlessness when speaking to a parent who has a child with a disability. I also have to admit that in my lack of ability to know what to say, I have fallen back into the use of trite, thoughtless responses. When I read this post, by a lady I do not know, and whose blog I had never read, I heard the heart cry of many parents I have known, over the years, who have been forced to be captive audience to the things we have said to them. The things that, although not intended to be hurtful, they echo in the hearts of those mere human parents for days, weeks, and even years to come. Adrienne Jones and hubby Brian, live with their family of three sons and one daughter, in Albuquerque, NM. Their youngest child, Carter, lives with special needs that keep their family on their toes. It is the raising of Carter that, I feel, gives her the right to speak to us today, in her post Dear People Who Do Not Have a Child With Disabilities. Please click on the link, and read her story at her blog site. It was through a social networking site that I was made aware of this event and the guest post about it. A friend from high school (now that was a while ago) ‘shared’ the post (which was about an event her own daughter participated in), and I smiled through each and every word. As a person who works with students in both Special Needs and Learning Assistance, and as a believer that we are all given life for a reason, I am drawn to stories of those who struggle with life, due to disabilities and disorders. I am also drawn to stories of predictions of what a particular child might accomplish in life, verses the abilities that they actually can accomplish. Such is the case in the story that Pascale LeBrasseur has told on her blog Lessons From My Daughter. I encourage you to not just read what I have shared here from her post, but also check out her story, alluded to in this post, in her pilgrimage to provide the best life she can for her daughter, Emily. For those who do not work with students, children, and adults who have challenges, know that what they want is what we all want … to be known (acquaintances), to be cared for (family) and to be liked (friendship). 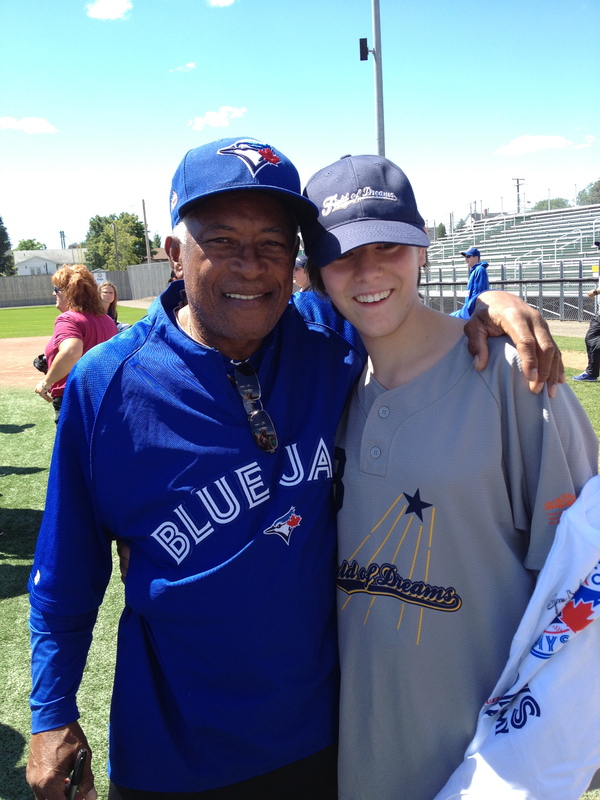 It was magical for Emily, for her team mates from the Field of Dreams, for all the parents standing there and taking pictures and making videos, for the volunteers, for the Hub City Brewers and for the Blue Jays organization and former players! Yesterday was something money can’t buy for our kids with various ability levels. Look at this video of Emily! If you are new to my blog, you are probably thinking that Emily is a pretty poor baseball player. That’s ok! I get it…. Allow me to help you see the magic in that short video. Emily was diagnosed with Cri du chat syndrome in October 1999 when she was 15 months old. At the time, we were told (amongst other things) that she would never walk, understand us, recognize us, communicate with us, her brain & body would never function properly. She is exactly where she needs to be, standing on her own, swinging that bat around to warm-up, keeping her eyes on the pitcher and on the ball. Her eyes are telling her brain that the ball is coming and her brain is telling her arms and hands to move at the exact time required to hit that ball. Once she’s made contact with the ball, she puts the bat down and runs to first base. At first base, she high fives…. Roberto Alomar! Who’s Roberto Alomar? Come on… really? You don’t know??? 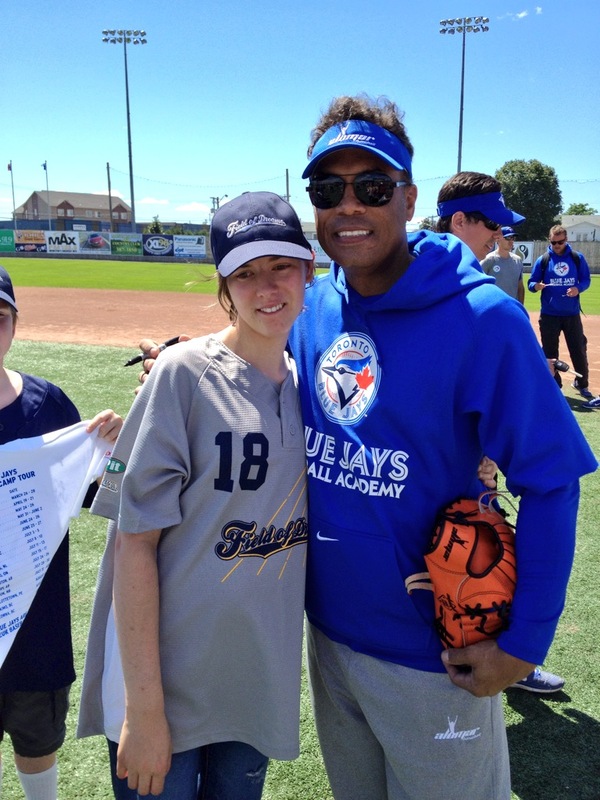 So… now that you know all the things Emily would never do and that not only she’s awesome on that video, she’s also playing baseball with former Blue Jays player and Hall of Famer Robbie Alomar…. Let me ask you again, how is that video? I admit that my voice is annoying but overall that video is amazing!!! The afternoon was beyond anything I could have imagined. I wished the newspaper would still let you read it on-line for free, I would have love to give you the link to the article because it’s great. They talk about the Blue Jays players but they mostly talk about our players. See these guys with Emily? She was chatting with them while the “Blue” were at the bat! 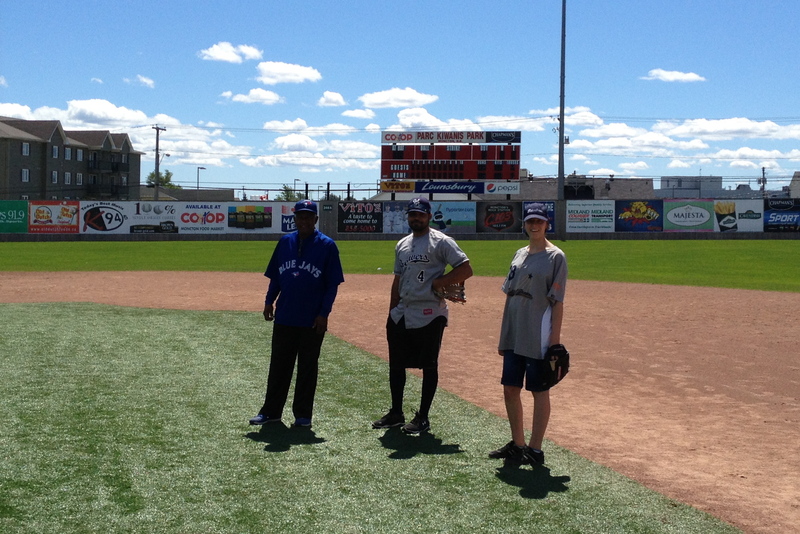 The guy on the left is Sandy Alomar Sr. http://en.wikipedia.org/wiki/Sandy_Alomar,_Sr. Turns out Emily was telling him about hockey and Justin Bieber…. LOL…. 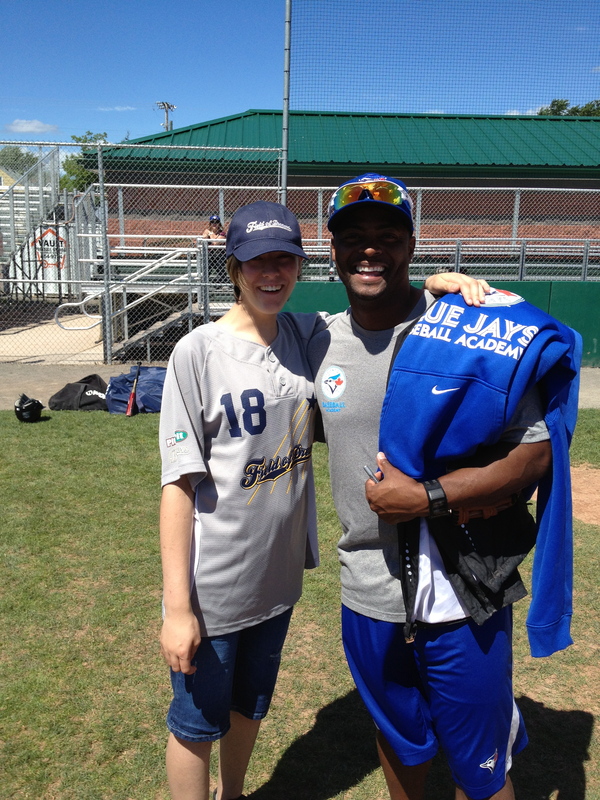 she talked to a former MLB player about her favorite sport to watch….. Hockey!!! How awesome is that? Talk about full honesty, no pretenses, no BS… just 100% Emily truth. 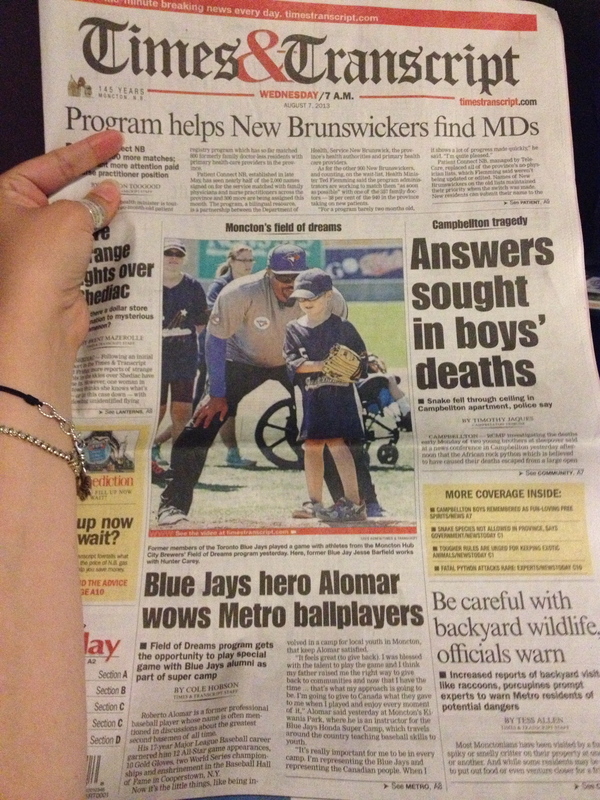 In the newspaper article, they mentioned how one of our player asked Duane Ward if he plays Super Mario. The guy won 2 world series but our player wanted to talk about video games … and apparently, Duane is not really good at video games. 3 years ago, Emily lasted 15 to 20 minutes a week at baseball than wanted to go home, Now she stays for the hour and a half. 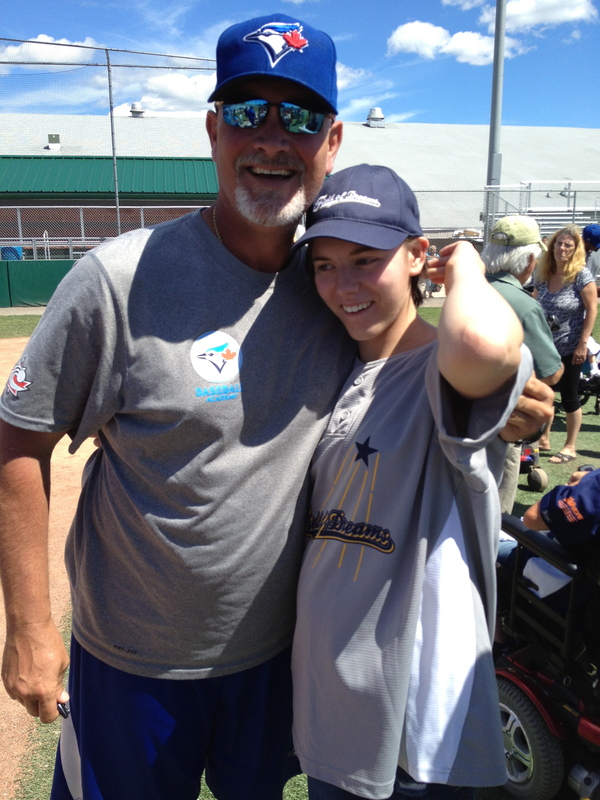 She gets there, says hi to Lexie, Jacob, Pascale, Taylor and so many more… She gives Brent a hug, says hello to Pat (the field of dream pitcher) than look for Mikey. He’s number 7 for the Hub City Brewers and he is Emily’s favorite guy. Not sure why she picked him… but over the last 3 years, that guy has allowed her to talk about Justin Bieber as much as she wants. He is helping her learn to catch the ball… that’s a work in progress and he is not giving up. In previous years, when Mikey was not there, Emily used to be completely lost but now she can go see another player and manages just fine. When people look at our kids they see their differences, they see their disabilities. 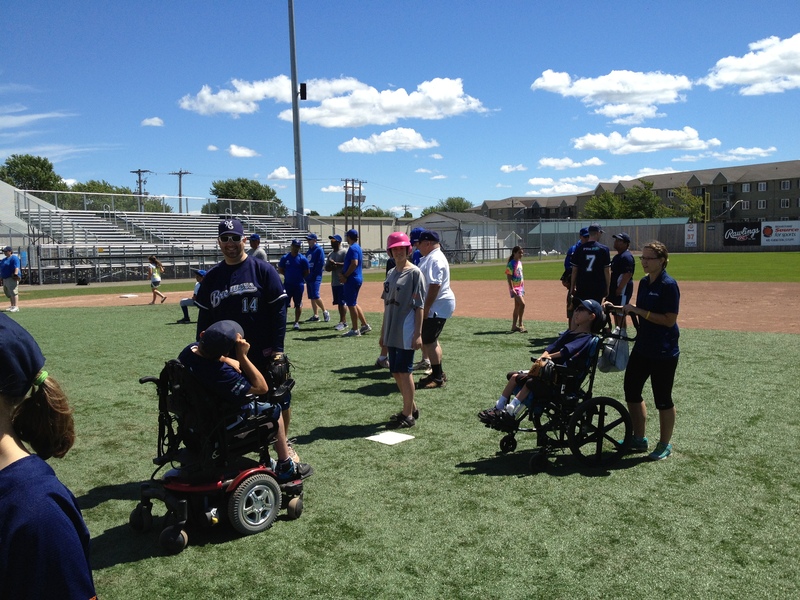 Yesterday on that baseball field, I only saw abilities…. abilities of various levels. Everybody at the same level, it’s easy when the game is just a game. Everybody went to bat and went around all the bases. Nobody counted points, not because they are all winners but because it was a game! It was fun! Grey or Blue team didn’t matter, they all cheered for each other, they all high fived each other, they all laughed and ran and played! Thank you to all that made that day possible! Those guys, all have jobs, they train with their team, they play games from Spring to Fall and spend 1.5 hour per week with our kids, playing baseball. Making each and every single one of them feel like a pro baseball player. 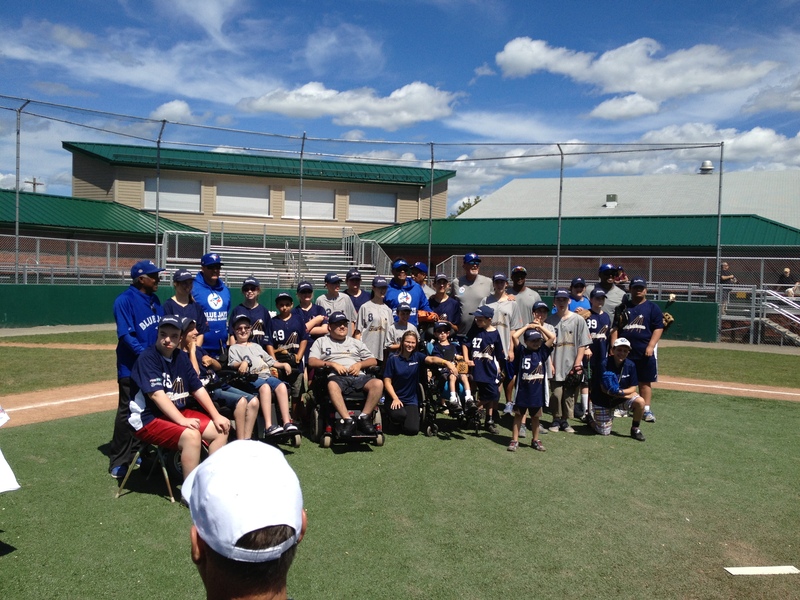 The opportunity to play with the Blue Jays was made possible by an alignment of stars and the contribution of not only the Blue Jays and the Hub City Brewers but also the involvement of Baseball Canada’s challenger program.